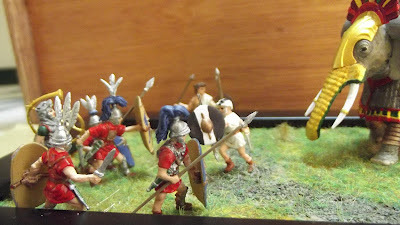 A weblog on mainly militairy models in mainly 1/72. 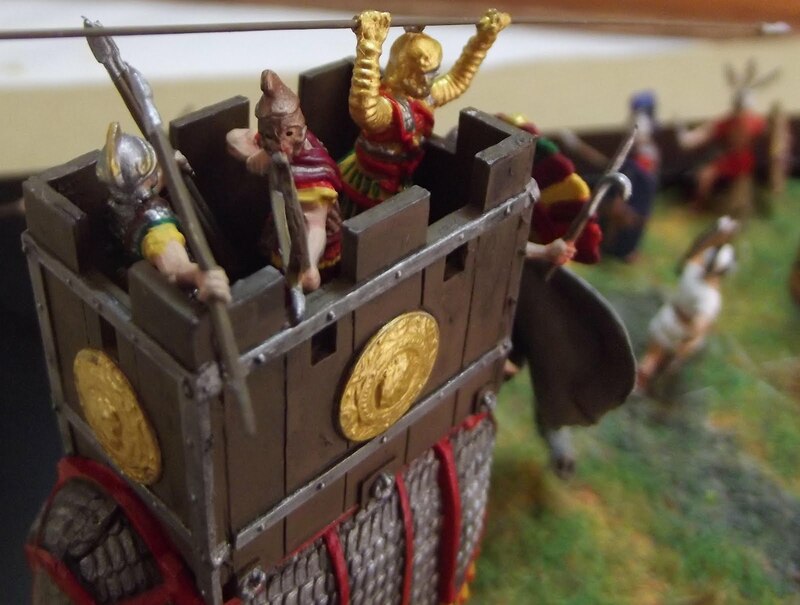 Expect a lot of posts on tank & figure models from Revell, Italeri and Armourfast. After almost a month finally a new entry on my weblog. This time a diorama of a Carthaginian war elephant during the second punic war. 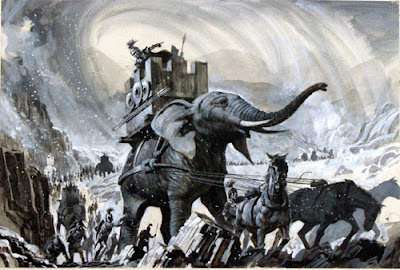 This war was fought in what is present day Italy and is the war in which Hannibal marched his army, including 3 dozen elephants, over the Alps. 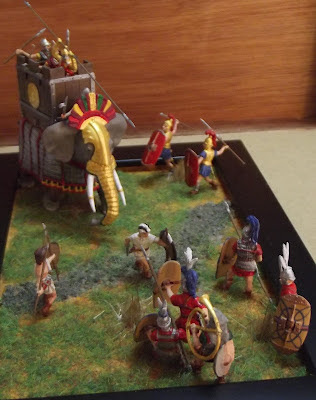 Hannibal made several crushing defeats to the Roman army but lost all his siege equipment and elephants so he was not able to attack the city of Rome itself. 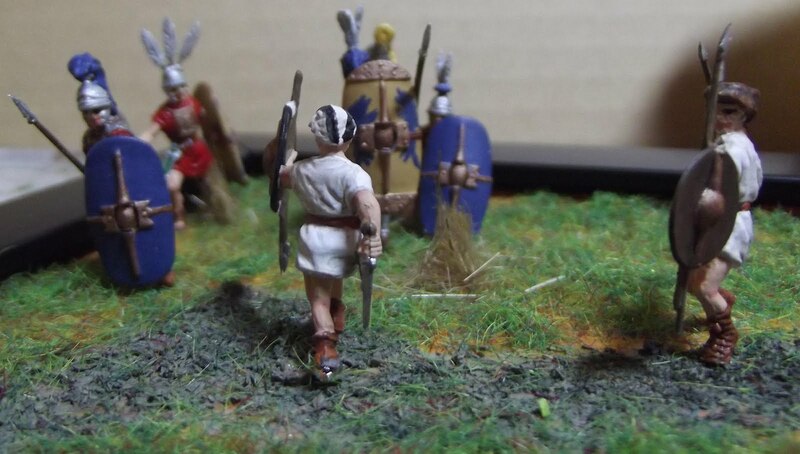 For 15 years he raided the country side of north Italy to supply his army with all the needed commodities. He also hoped to break the alliance between Rome and neighbouring states but his strategy failed. Meanwhile Rome and his allies were able to cut off Hannibal's supply lines slowly deteriorating the strength of his army. 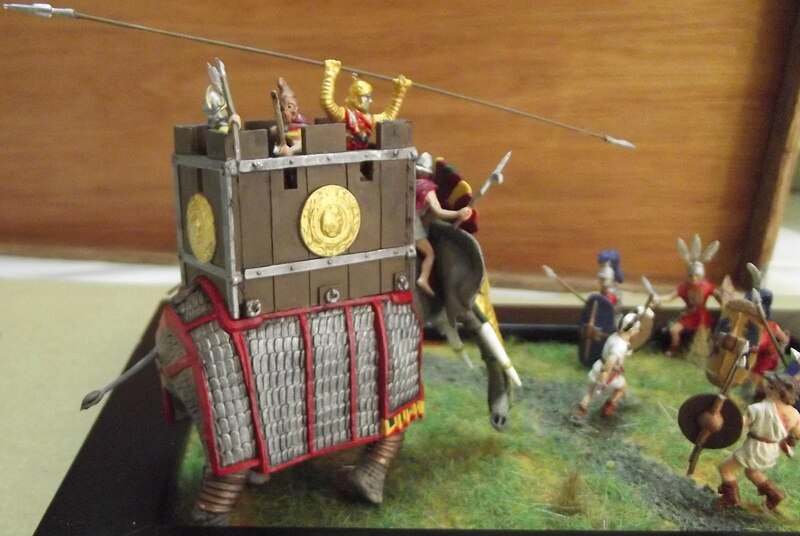 Meanwhile Rome launched an assault on Carthage (roughly present day Tunisia) itself. 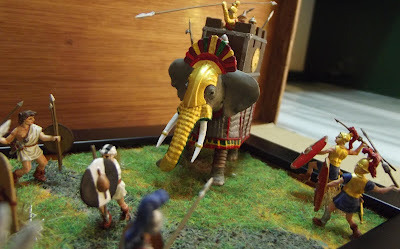 Hannibal rushed home and was crushed by the Roman army under the command of Publius Cornelius Scipio Africanus at the battle of Zama ending the second Punic war and Carthages reign as a power meaningful power in the Mediterranean. 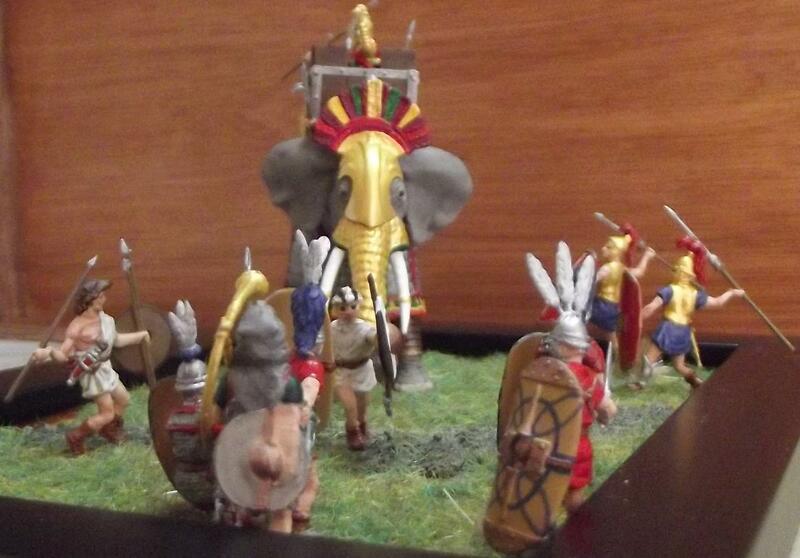 The elephants used in the second Punic war were North African forest elephants. A kind of elephant which is extinct these days because of over exploitation. Elephants are strong and intimidating beasts on the battle field. 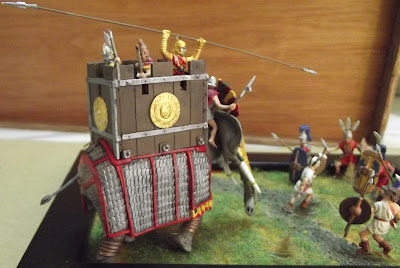 There strength allows them to carry more then one soldier in a protective structure. They are also high above the battle field giving a good overview. Elephants also have a few down sides most noticeable their fear of certain sounds. The screaming of pigs or sound of certain horns makes them turn 180 degrees and race right back to where they came from, usually right trough the army of the owner. 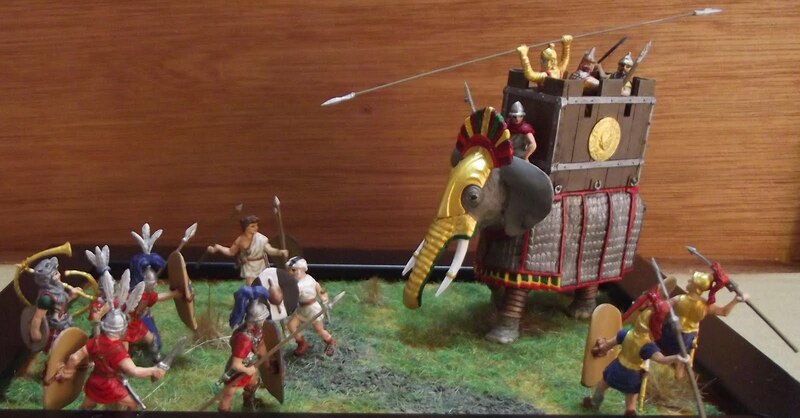 This weakness was regularly used by enemy armies of elephants. To counter this problem the handler of the elephant had sharp chisel to hammer between the neck vertebrates of the elephant. An other downside of elephants is that they walk in a straight line when charging. Scipio arranged his men in line formations during the battle of Zama and they evaded elephants by simply stepping aside. 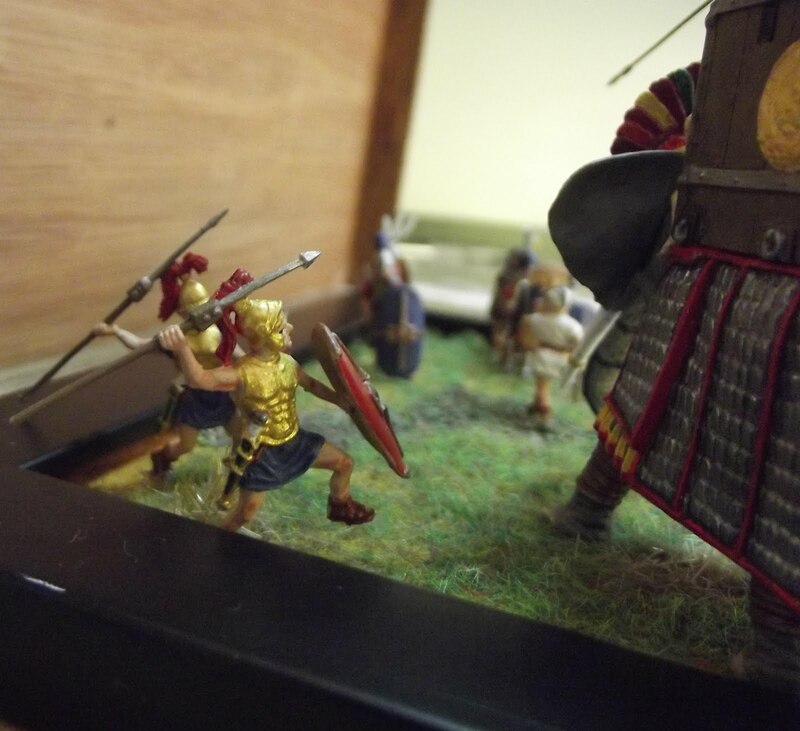 Enough history for today and on to the diorama. 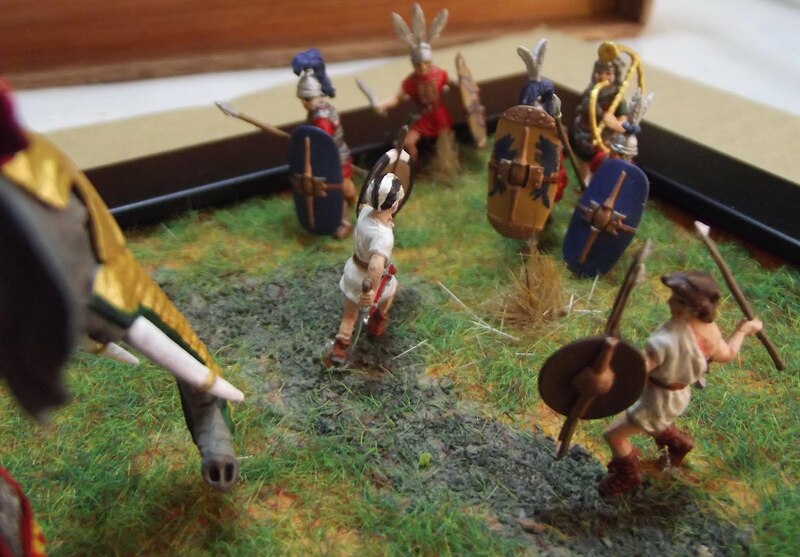 Zvezda is a model manufacturer from Russia and has an excellent line of figures. Kit No. 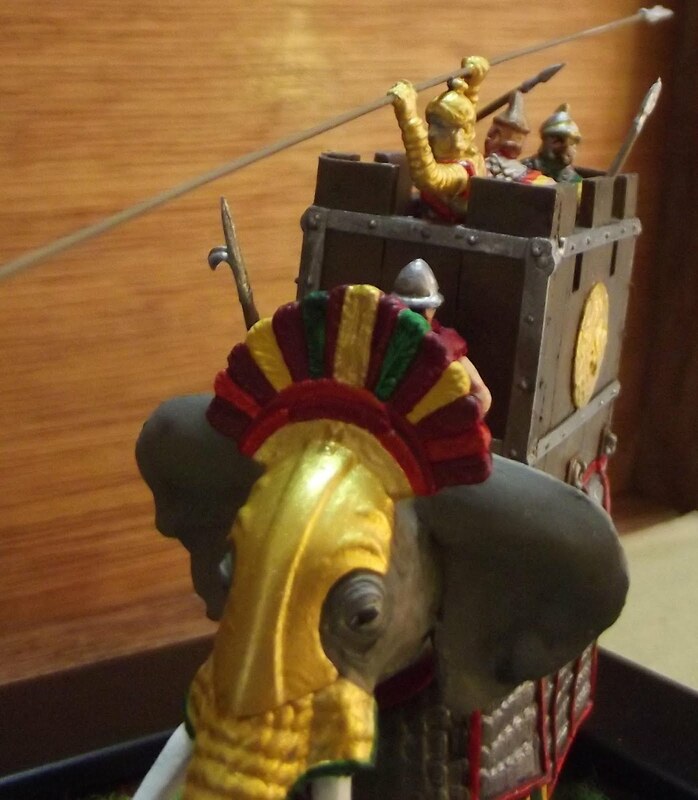 8011 is a set of an Indian and African war elephant, both come with riders. Kit No. 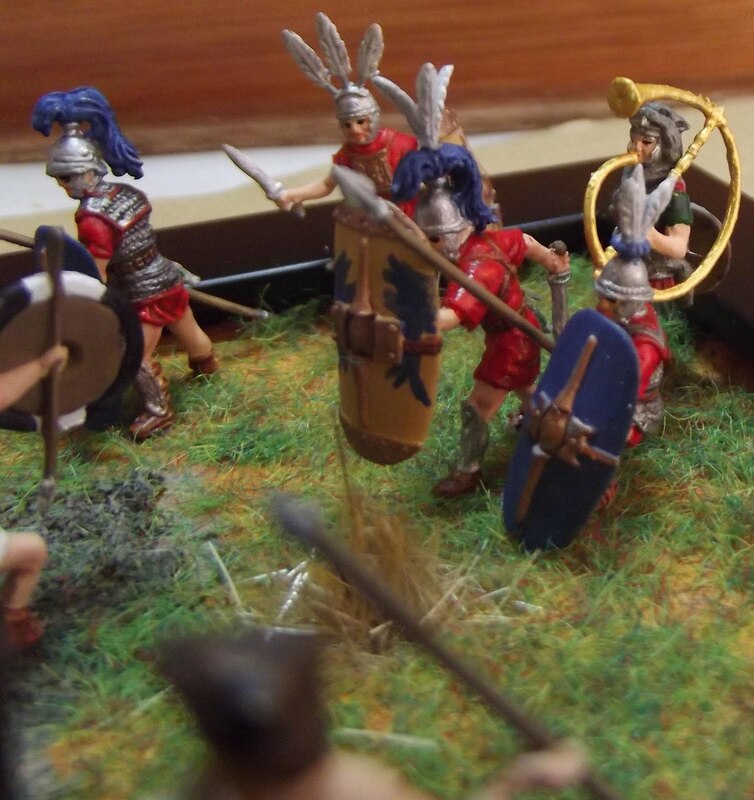 8034 is 'the republican roman army'. All 4 classes of soldiers (Princeps, Triari, Hastati and Velites) are present as is a set of command figures. A pretty complete package! 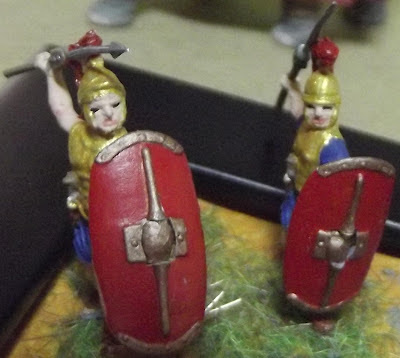 Both sets contain excellent figures surpast only by Zvezda's later editions. Both sets are made of the typical soft plastic figures are often casted in. 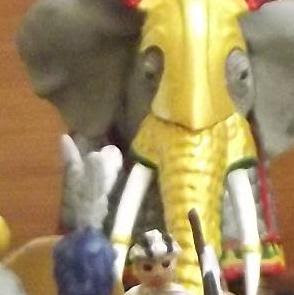 This plastic is nearly ungluable so Zvezda made the elephant in such a way no glue is needed. Unsually I don't really thinks this works well but this is a noticeable exception. 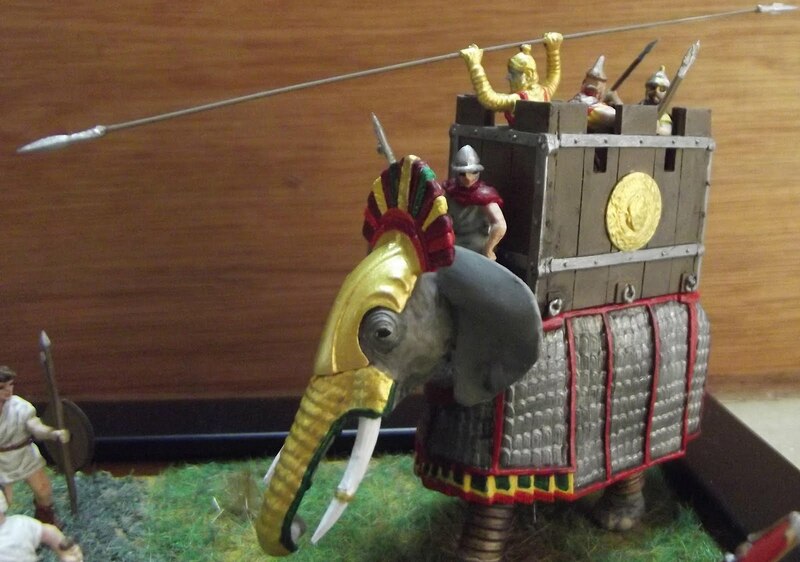 Before I pressed the halves of my elephant together I did put some of Revell's putty on the halves to fill up the last tiny holes. Zvezda also did an exelent job of placing moldlines in a strategic place making them unseable. This is important because they are difficult to remove due to soft but difficulty cut and sandable plastic. 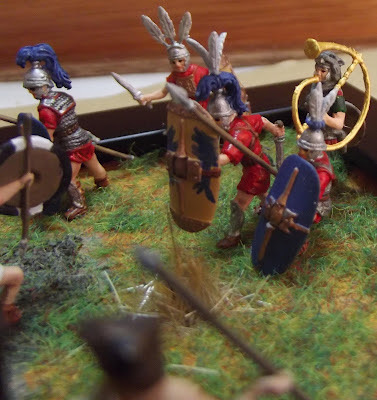 (all manufacturers make their figures in this plastic except some sets of Italeri figures) On the Roman army set more work has to be done but I have seen worse sets! The only real weakness is the long spear if one of the elephant riders. It is cut in two and has to be joint together by a small shaft leaving you with a spear that has a thick bubble in the middle. This is obviously not right so I replaced mine with a 0,5mm styreen rod. I did glued the original tips to this rod with super glue which worked well even in this kind of plastic. A final good point of all Zvezda sets is the excellent and inspiring boxart.